Update: Check out Nagios which is an open source service monitor. This looks like a good solution. Wish I had found it before I did my little project! 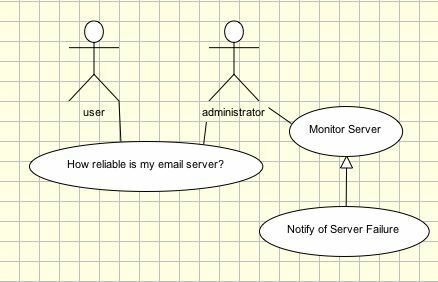 ServerMonitor is a small java program that monitors a server and sends email to the administrator when the server is not available.I have been having some reliability problems with a server that I depend on and wanted an easy way to be notified if there server had stopped running. This program is very simple to use. The program consists of a single java file ServerMonitor.java [text] and a script smctl.sh to start and stop the monitor. 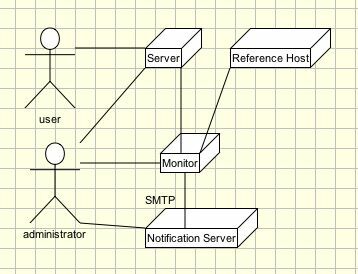 I need feedback regarding a service running on Server. I run a ServerMonitor daemon on Monitor that periodically checks to see if it can connect to Server on a specific port. If it can, I assume all is well. If not, ServerMonitor checks to see if Reference Host is visible. This is to distinguish between an actual failure in Server and a local problem with the connectivity of Monitor to either Server or Reference Host. If there is any failure to connect with Server then email is sent through Notification Server to the administrator. Create a directory serverMon on Monitor and put ServerMonitor.java and smctl.sh in that directory. Then cd to that directory and follow these directions. You should now have a directory that looks something like this. Now you need to edit smctl.sh to set the relevant parameters. [drew@drewsG5 serverMon]$ ./smctl.sh start [drew@drewsG5 serverMon]$ tail -f log.out Starting ServerMonitor. host:mail.host.edu port:25 refHost:www.host.edu refPort:80 interval:10 adminEmail:you@localhost smtpHost:mail.smtp.localhost [Mon May 03 17:18:31 PDT 2004] mail.host.edu seems to be running. Note that only one email will be sent on server failure. When the message is received, you should examine log.out for details about the failure. Then I suggest that you stop and start ServerMonitor again to check for the next problem. # so that we don’t start twice. # is actually the ServerMonitor process! This entry was posted in Uncategorized by andrewk. Bookmark the permalink.